There is nothing cuter than seeing your dog covered in the fluffy snow or in Christmas sweaters and winter booties. Taking your animal outside in winter is fun for everyone. However, there are some dangers to look out for to keep your pet safe during the winter months. One. Hypothermia can occur in animals during the winter months despite their fur coats. If their temperature drops from the normal range (100-102.5ºF) and is left untreated, it may lead to coma, heart failure, and even death. In addition, frostbite may occur and limit blood flow to their extremities in order to preserve flow in their vital organs. 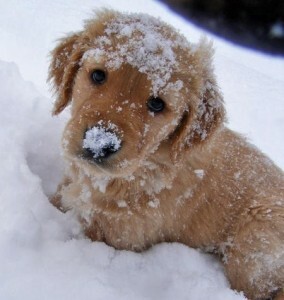 If your dog may have hypothermia symptoms include paleness and intense shivering. Two. Antifreeze is a coolant used in cars to lower the freezing point of liquid. Whether it is leaking from your car or from a spill, antifreeze contains ethylene glycol, which is extremely poisonous to your pets. The bright color and sweet taste entices your pet to clean up your mess. If not treated immediately, this can be fatal. Initial symptoms include drooling, vomiting, and “drunk” walking. The obvious signs are resolved within 24 hours; however, severe internal injury occurs. Acute kidney failure, seizures, and coma are feasible symptoms that occur between 12-24 hours for cats and 36-72 hours for dogs. Three. Car exhausts and wheel wells provide warmth for animals during winter. When running, the exhaust omits heat. Therefore, some animals find warmth by standing near the exhaust, which is dangerously placed in the back of the car. The animal can be easily run over. In addition, some cats even find a way to get into the hood of the car for warmth. Once the car starts moving, the animal may be tangled in the engines parts. Lastly, carbon monoxide poisoning is another hazard for pets. This occurs if the car is left running in a closed garage. These hazards are easily preventable. Four. Rock Salt is an ice-melting salt that not only can chap your pets paws, but also can poison your pet if too much is consumed. Some symptoms include vomiting, lethargy, drunk walking, abnormal fluid accumulation throughout the body, excessive thirst or urination, potential injury to the kidneys, seizures, coma, and even death. Rock salt poisoning is preventable by purchasing pet friendly ice-melting products or dressing your pet in winter booties. Five. Rodent poison is commonly used during the winter months because rodents often find warmth in our homes and offices. The poisons are often left for pets to get a hold of as well. There are many dangerous ingredients in the rodenticide and can be deadly to dogs and cats depending on how much was consumed. 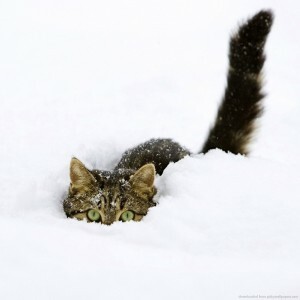 Most winter hazards your pet may encounter are preventable. Be aware of these potential hazards and your winter will be a wonderland!